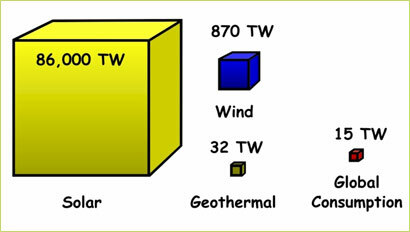 Available Renewable Energy The volumes of the cubes represent the amount of available solar, wind and geothermal energy potential and (the smallest cube) the proportional global energy demand. Over the past year, it has become clear that the world is in the midst of a so-called “perfect storm” of high energy, food and commodities prices, occurring at the same time that growth is faltering in key global economies. As elsewhere, the Eastern Caribbean nations are scrambling to react, with policies and projects intended to reduce the impact of the situation on already fragile economies. The region has largely been caught napping. The rising costs during the past decade of imported fossil fuels (figure 2) should have resulted in far more widespread use of renewables than has actually occurred – and the barriers have not been technical. The Caribbean Renewable Energy Development Programme, a Caribbean Community (CARICOM) program established in 2003 to remove barriers to the increased use of renewable energy in the region, dryly notes that the barriers to the adoption of renewable energy in the Caribbean are “policy, financing, information, and human capacity” barriers. More to the point is the likelihood that the situation is the direct result of a regional failure of leadership, policy and governance, which failure has three components. The first is that our governments have misunderstood their policymaking role and have allowed the electricity companies to have too much influence over national energy policy. Rather than make overall energy sector policy that the electricity providers would have to conform to, the governments have, in a breathtaking error of omission, allowed the utilities to essentially dictate the parameters of national energy policy. Couple this with feeble or non-existent national frameworks for the regulation of the electricity sector and the result is a situation where the status quo (ie: continuing investment in diesel power) has been disturbed only occasionally. The second component is that there has been little real commitment, at a policy level, to regional electricity sector integration. The regional power companies have failed to elaborate coherent and collective policy relating to the development and operation of our electricity systems that can be applied across the region. The cooperative efforts and achievements of the regional electricity sector have been focused on ‘functional cooperation’, which is very important; but functional cooperation only focuses on today’s problems. This brings us to the third component. The third and perhaps most fundamental problem is that successful policy requires vision. Vision requires questions to be asked, such as: where is this enterprise going? Where should it be going in the long term? And how best should it get there? Unfortunately, the OECS electricity sector leaders have generally failed to elaborate any progressive ideas regarding the long-term future of their industry. Is it really a surprise that crude oil (and therefore our electricity) is now on the verge of becoming prohibitively expensive? Not to anyone who was paying attention. For an example of the opposite situation, consider the case of Costa Rica. Even before the oil crises of the 1970s, most of its electricity had been produced by hydropower. But by 1992, the percentage of electricity generated by imported fossil fuel was 15% and rising. Today, due to a combination of visionary leadership, policy and governance, Costa Rica produces 98% of its electricity from renewable sources. Most of this is hydroelectricity, but about 15% of total electricity production is from geothermal energy, with small amounts of wind and biomass making up the balance. Costa Rica achieved this remarkable turnaround by taking action 15 years ago. The vision of the country’s leaders to achieve energy independence was translated into two laws, implemented in 1994, designed to encourage production of electricity by renewable sources (which led to the birth and growth of geothermal, wind and biomass electricity production) and to promote efficient energy utilization throughout the economy. Taken together, these two pieces of legislation had an extraordinary impact on Costa Rica’s energy balance, making it one of the least fossil-fuel dependent countries in the world. Similarly, we can look at Brazil (which is an oil-producing country) for another example of visionary energy leadership, in the development of its sugar cane ethanol industry for production of vehicle fuel, which now replaces 40% of Brazil’s gasoline imports. And of course, there is Itaipu which, though the implementation of some of its commercial aspects may have been flawed, is a model for regional technical and policy cooperation.